Another project hits the dust! woo hoo! 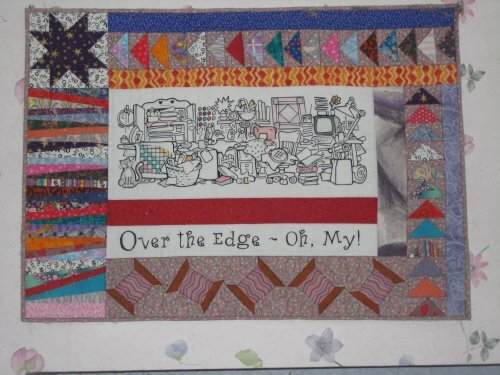 At this year's Pacific International Quilt show in Santa Clara, CA, I bought a kit called "Over the Edge" which included a FQ of original hand-printed fabric. 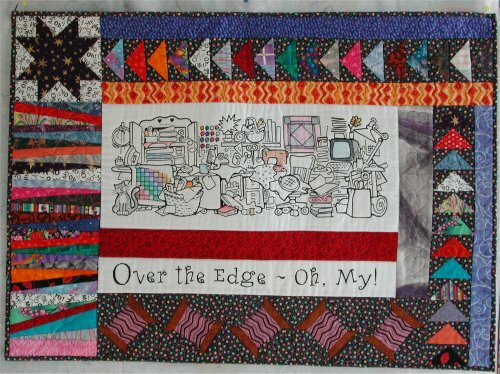 The hand-printed fabric had 3 elements: a line drawing of a completely disorganized and cluttered sewing room, a title strip and a background strip of exclamatory words. The sample at the booth was delightful and I realized this would be a great scrap fabric project (not that it would make a huge dent in diminishing my scraps, but I wouldn't need to buy any new fabric to make it!). My own rendition of the wall-hanging is slightly different from the kit's ... I have an extra vertical sashing on the right hand side. You'll see a series of topsy-turvy spools of thread at the bottom of the wall-hanging. Somehow, I managed to make the spools of thread larger than they should have been, resulting in a longer strip than the pattern calls for. To compensate, I added the extra vertical sashing. [shrug] eh .. I wasn't about to remake all those spools of thread. Then it came time for the actual quilting. 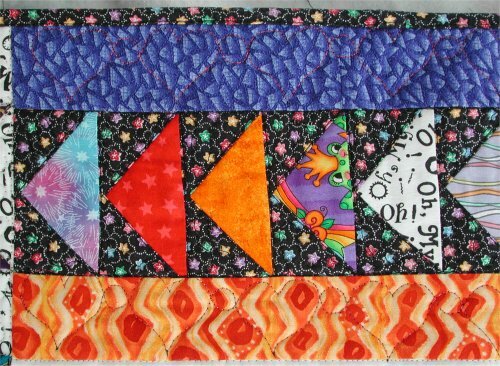 I am truly dismal at coming up with novel ideas for quilting motifs; I tend to "stay in the box" and this wall hanging was no exception. I stippled in the black background areas and the background behind the purple star. I outlined stitched many objects in the line drawing .. you can't see the quilting cuz it's black just like the lines, but it does give a slightly dimensional feel to the center of the quilt. 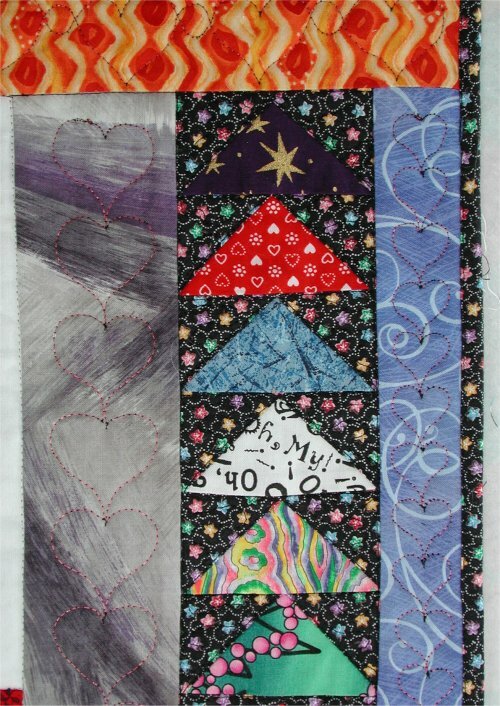 I found some continuous line hearts, both vertical and horizontal, that I sized to fit the various sashing bands. (I did the resizing by computer: I scanned in the quilting motif, edited it in my graphics editor to the different sizes that I needed. I was quite pleased at how (relatively) painless this was.). 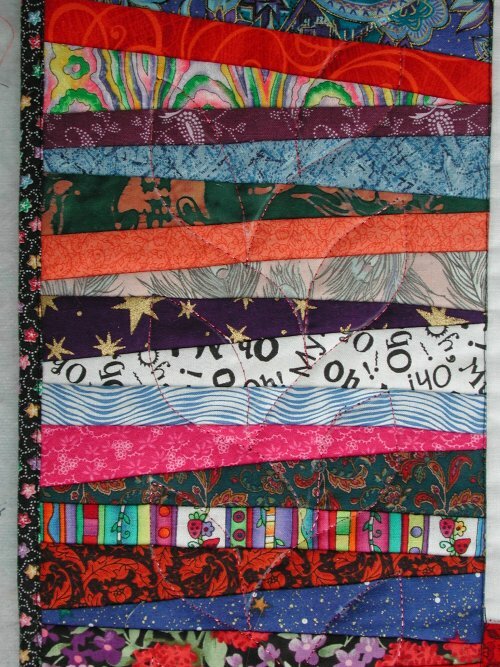 The 'fabric bolt' band was quilting in a continuous line vine motif. I used Superior's Glitter thread for decorative stitching and Aurofil for the stippling. The finished size is 2' x 3'. Cautionary tale:This wall-hanging has been positioned on a *north-facing* wall that never EVER EVER gets ANY sunlight. Ever. There's natural daylight in the room, of course, but sunlight NEVER hits this wall where the wall-hanging is. Maybe that indirect sunlight, eventhough it may never hit the fabric, can indeed cause fabric to fade? Could be.